The only hope for humanity to find true peace is to submit to the authority of the Prince of Peace, the Lord Jesus Christ Himself, and to commit to trusting entirely in Him for the only real redemption of our broken world. He was born to die for the sins of all mankind, to give Himself up to His enemies who hated His preaching that all should repent and turn back to God again; none of them ever suspected that their wicked execution of Him on a dusty Palestinian hillside over 2000 years ago would be an act that ultimately served God's glorious purposes for our world. No human religion, philosophy, political system or cultural innovation can ever duplicate this glorious act of God's saving grace. Though conceived out of the vicious evil of man's designs, this death was long prophetically revealed in the Scriptures as an act that would become humanity's bridge back to God the Father, the One whose great love sent Jesus, the Son of God, to that cruel cross. His resurrection from a stony tomb three days later became the visible manifestation to this twisted world that His message, His Gospel, was indeed the absolute truth: He alone was the Way, the Truth and the Life for all nations to follow. This was indeed a decisive act in history that still shakes the confused nations today, and although they may all respond, react or reject His life and testimony, His Love for us all established that Way, a narrow yet sure footbridge whose power still changes and transforms men and women today, who then collectively change the course of human history by striving to live, however imperfectly, lives that please Him. Jesus then ordained that this Gospel be spread by His disciples to all the four corners of the world and ascended into heaven - forty days later, He sent power from on High by a literal baptism of spiritual power upon them during the Jewish feast of Pentecost in Jerusalem. From then on, the proclamation of Jesus as the only Savior and Hope for the world has spread around the world, across history and continues today. This great enterprise of the preaching of the Gospel of Jesus has taken many, many twists and turns throughout history, at times almost captive to the institutionalization of the church community that was to have proclaimed it. But it has endured, testifying to the power of God to transform men's stony hearts by faith alone in Jesus, a power that has also transformed whole families, cities, and nations - and moved a world away from the barbaric coldness of life apart from Him and His Son. The collective tribes of people who have turned to receiving the Lordship of Jesus over their lives have been called Christians, disciples of the Palestinian Jew who was more than just man, but was God manifest in human flesh, whose very life was God's final testimony of His plans and purposes for mankind. 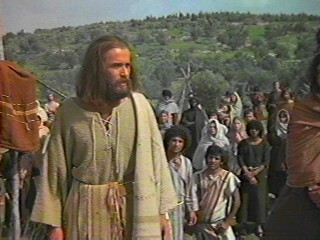 The Bible's most compelling symbols of who these Christians are and how they are to relate to one another is viewed in the description of them as the ekklesia, the "called out assembly" of the Church, spiritually interconnected to one another as the Body of Christ, under whose Head is none other than the Lord Jesus Himself. Though ancient and modern sectarian divisions and breakaway fellowships across the world may seem to overwhelmingly obscure it, God's Spirit still secures Christians today by their faith in Him and Him alone, moving and leading His flock, the Church and Body of Christ, onward toward the shining pastures of ultimate rest in the fairest destination of His Father's House in heaven itself. Of these various changes that have transformed the advance of the Christian movement itself since the Protestant Reformation's as led by the courageous stand of Martin Luther and others, few have been as controversial and influential as that of the development of the 20th century "Pentecostal" movement. The spiritual foundations that Pentecostal teaching builds upon are the essentials of orthodox Christianity, such as the belief in God as Triune Father, Son and Spirit, the Lordship and Deity of Jesus Christ, His virgin birth, sacrificial death for mankind's sins, literal resurrection and iminent Second Coming. It embodies a firm belief in the priesthood of believers who, empowered by these gifts, can share the Gospel with a boldness and authority not of man but of God's Spirit Himself, always pointing to the fiery baptism of God's Spirit at the day of Pentecost in the book of Acts as the truly Biblical pattern for the church to follow. Pentecostal belief also holds that spiritual giftings have been given to men by God for the work of Christian ministry, the most widely known obviously being the gifting of tongues and interpretations of them, but by no means the only ones bestowed upon Christians by Him. Giftings, according to 1 Corinthians 12, can range from prophetic utterances, gifts of healing and miracles as well the discerning of spirits and the dispensing of God-given insight of revelation as well as divinely enabled and absolute faith. In a dynamic, grounded Pentecostal church setting, all believers may freely share, worship, testify and serve both any and all with personal prayers, encouragement, and counsel that are both Biblically-based and Christ-centered. And embedded in this sort of "Pentecost" is an exuberant, lively willingness to worship with an energy and passion that focuses on exaltation of Christ in a way rarely seen elsewhere in the Body of Christ. But Pentecost always has drawn deeply from it's roots, buried in the church history of the past 400 years - whether or not contemporary revivalists and iconoclasts within the subcultures that constitute it are willing to admit it not. "Pentecost" (a term used by those in the movement to describe it, and I will refer to it as well) is a unique spirituality with American roots stretching back through time to the German Pietist movement of the late 16th century, yet more directly drawn from the spiritual legacies of Wesleyan and Baptistic tradition, as well as the great holiness revivalism of America's 19th century. Evangelicalism has been the foundation of much of Pentecost's theological and practical underpinnings as well. The Charismatic movement which emerged in the 1960's directly originated out of Pentecost's influence, yet is a movement that is unique and distinctive enough to be differentiated from its' Pentecostal forebears, although both remain inextricably bound together in most people's eyes. As in most cases, unfortunately, each of these great advances of Protestant Christian thought and practice to which Pentecost owes it's existence remained firmly behind their respective partisan camps. These varied movements failed for a myriad of reasons to approach one another in a consistent manner as members of the Body of Christ and more often distanced themselves from one another, or worse, engaged in passionate and all too frequent doctrinal conflicts or turf wars stemming from inter-denominational proselytyzing. In general, the Protestant heirs of the Reformation legacy focused much of their energies in perpetuating their own sectarian perspective on the task of world evangelism and discipleship, racing to plant and establish church plants and mission outposts around the world during four hundred aggressive years of American and European colonization. While each party certainly had at its disposal for examination the writings and distinctives of one another (few Baptists were unaware of what Presbyterians stood for, for example), and while there were instances in which various denominational representatives sought dialogue and cooperation, the battles over dogmatic doctrinal and practical positions, on a thousand fronts throughout Christian circles worldwide fractured needlessly the underlying unity that the Spirit of God had bestowed upon them. This sad pattern would painfully persist in Pentecost as it does today. Instead of the hopes for increased cooperation among churches in the 19th century there developed a keen competition among them along purely sectarian lines, to be slowly confused with postchristian 20th-century consumerism. or an ecumenical inclusivism that reduced Christianity to being just one of many "world faiths" that mustn't be viewed too exclusively as the one true Faith. Religious consumerism became a major trend away from traditional denominational membership and loyalty towards more individualized, self-centered forms of Christian spirituality that downplayed or dismissed affiliations with historically identifiable and organized Christian fellowships. It sought bold "new wineskin" forms of Christianity that were pragmatically aimed at personal needs, seeking to pattern itself after a million versions of a "restored New Testament" reality. The "non-deminational" and "interdenominational" forms of church life sprang into being, from cell home churches in the 1960's to cyber churches in the present day. With the changing social dynamics of the "graying" of America's postwar baby boomers and the emergence of Generation X'ers, decentralized nontraditional Christian religiosity is clearly on the rise. This Christian consumerism has placed even more pressure on a Christianity already suffering from the secularizing pressures of a postmodern "culture of disbelief," as author Stephen Carter has described our present Western-dominated society. 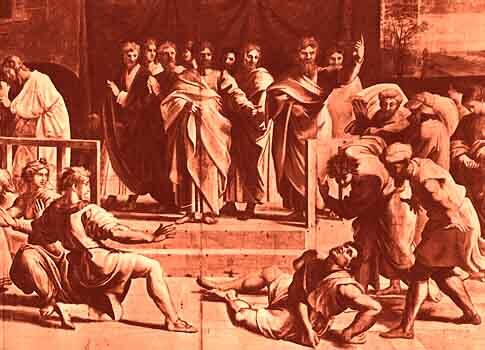 And here is where the story of Pentecost takes a decidedly tragic, spiral turn to the fringe .. The insights that could be gleaned from Pentecostal and Charismatic believers to empower the global Body of Christ to help address man's modern spiritual need have been severely stifled, strained and even cut off due to their movement's collective extremism. While there are many great spiritual emphases and teachings which we feel would be of enormous blessing and profoundly transformative benefit to the entire Body of Christ, our collective Pentecostal voice has effectively been stifled and our outstretched hands have been ignored by many Christians today as a result of the extensive doctrinal and practical excesses, abuses and heresies that plague both movements. It has not been factional bias alone that has closed these minds and ears off, but Pentecost's own grievous errors that have blackened Pentecostal and Charismatic eyes. It has not been rejection of God's Spirit alone, but "Charismania's" distortion of His Word that has kept Christians at the proverbial ten foot pole's length from it. And it has not been a calloused rejection of spiritual truth by the Body that has turned it aside from Pentecost alone, but it's clear and at times profound discerning of its' lack of soundly solid Bible truth which has brought about the grave divisions between the so-called "Full Gospel" Christian camps and those who don't recognize them ("Full-Gospel" being a term used loosely by many Pentecostal, Charismatic and so-called "Third Wave" Christian groups who are polarized around various Pentecostal/Charismatic-derived emphases). The diversity and pervasive influences of these errors are deplorable. It has been bad enough that the manifestation of genuine spiritual gifts are looked upon as marks of fanaticism or mental health problems. From backwoods snake handling to "birthing of the Holy Ghost", to urban River-surfing "carpet time" and gold dustings, the quest to encounter God in Christ by the Spirit has been lowered to a sensationalistic full-gospel pastime. From the "Jesus Only" message to the Prosperity gospel, the Biblical Good News of the Lord Jesus has been substituted with "another gospel" (2 Co. 11:5). From the overblown practice of "point of contacting" to "demon-blasting" shouted "warfare prayer", to seed-faith offering demands during telethons and fund raising, we've seen way too much inexcusable confusion and outright carnality. From the oracular nonsense about "hippos in the garden" to the deliverance phobias about "pigs in the parlor", a distracting and even defiling flow of human religious tradition continues to foul the springs of the Spirit which the Pentecostal and Charismatic movements have sought to edify other believers with. They have become ends in themselves, and even objects of idolatry used to justify the authority of self-proclaimed spiritual superstars and described as the "next move of God." The painful reality is that they actually are rewarmed, reworked versions of the same tired and unbiblical novelties rejected by the great majority of Pentecostals and Charismatics throughout the past decades who have weighed them and found them wanting in sound discernment - and whose spiritual discernment insights were rejected as "old order" and "tradition." What is far worse, however, is the extent to which these and other forms of extremism have profoundly swayed the Christian Church. They may be found zealously proclaimed, practiced and defended in virtually every circle of Christian Body life known around the world - from humble home Bible study circles in Tennessee to packed-out mega-churches in Europe; the influence of these false teachings and practices has sadly become one of the greatest challenges to the Church of Jesus and perhaps the deadliest leaven to ever infect these two movements. The penetration of global Christian culture with the philosophy, worldview, teachings and practices of these "Full-Gospel" errors is scarcely even a concern of far too many of those enthusiastically spreading them. Is it then any wonder why they are viewed with suspicion and even an equally unholy hostility by supposedly Spirit-led Christians not involved in Pentecost? Lest we be misunderstood, this unpleasant assessment of these extremisms should not be viewed as the product of anti-Pentecostal religious bigotry. These aren't the railings of prejudiced, cessationist Evangelical mockery of things they "don't understand." These aren't harshly judgmental blasphemies of the Holy Spirit by those who hate "tongues talkers" and are devoted to cold, dead, legalistic religiosity. Rather, these tragic summaries of error have been discerned by men and women who abide within these very movements, believers passionately dedicated to the principles of Pentecost. These are the conclusions painfully arrived at by discerning study conducted by thousands of Pentecostals and Charismatics to their heartbroken dismay - all the while lauded by tens of thousands more of them as the very message for the hour. Too many times in this century, movements that were born of the Spirit ended up as spiritual miscarriages. And in every case, men and women were responsible for derailing God's holy purpose. .. Charismatic churches in America today are laden down with tons of baggage that need to be thrown overboard. If we would reject our misguided mysticism, our smug elitism and our hollow egotism, I believe our churches would be aflame with holy zeal. If we would renounce our bizarre infatuation with money and success, I believe, God would grant us true passion for the Savior. If we would stop mistreating the flock of God, He might give us many more sheep to tend. And most importantly, if we would stop building our own human-centered kingdoms, He might afford us the honor of playing a part in building His (4). As a Pentecostal believer and minister myself, seeking to preach, publish and defend the Gospel of Jesus and the abundant life of Pentecostal graces, this has become one of my own great personal sorrows. Through my 24 years of ministry I have beheld - alongside its' wondrous glories and truths - the terrible power of deceptive extremism within my tradition, the Pentecostal movement. How heart-rending it has been for me to behold how well these excesses have been perpetuated by various individuals and factions since Pentecost's dawn in the 1880's! Such excess nearly destroyed my own fellowship, the Church of God (Cleveland) at its own birth, and such a stealthy foe of my fellowsaints within and without Pentecost have claimed the hearts and minds of so many of them. 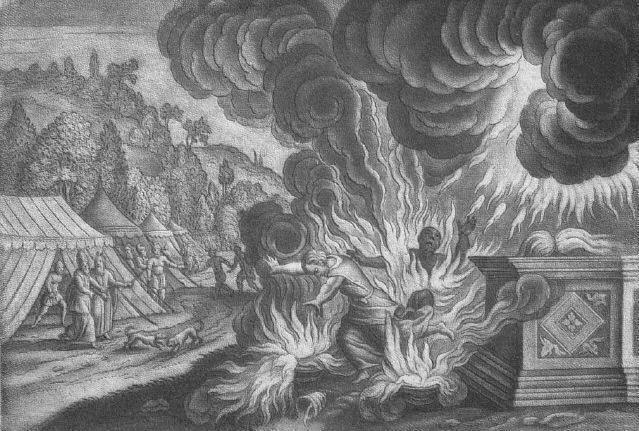 The last time such spiritual anarchy had so great a potential for decimating and perverting the Christian faith so severely was in the earliest days of the Church's existence in first-century Israel - a uniquely, supremely irony since so many of today's Pentecostals feel we live in the last darkening days before the return of Israel's Messiah once again to the world. What a prophetic irony, however, appearing to be almost completely lost upon those whom it should be most seriously and scrupulously considered! Therein lies our great concern: Pentecost is in the valley of decision, and in the crossroads of destiny. The Pentecostal and Charismatic movements stand at a moment of time in which they will either proceed onward to bless the world with balanced sharing of a wonderful, Biblical dimension of Christian faith or bring a curse of terribly, unbiblically divisive Christian fanaticism. It may be that the decisive moment has already passed, however. We may be beyond a point of no return and the Full Gospel Ship may not be able to right itself any longer. An apostasy from the Faith of unthinkable proportions was prophesied by Jesus Christ Himself in the end times. 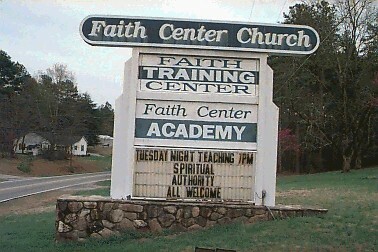 Could Pentecostals play a major part in it? It seems unthinkable, but if Israel, with God's very fiery Presence leading them daily through the wilderness could so rebel against Him with utter impunity, who are we to say that we'd not drift that way? No Christian movement has been more watched by the Christian community around the world than the advances of Pentecostalism around the world. And few Christian movements have been as dynamic and fast-growing as ours in the relatively short time it has come into existence, just over a century ago. Over and over, various religious researchers from across a broad spectrum of persuasion cite this truth all too clearly, and increasingly believe that the Pentecostal dynamic of Christianity could become a dominant spiritual influence throughout global Christianity. While such tidings clearly will gladden the hearts and minds of Pentecostals and Charismatics around the world, the hard questions remain: just what is Pentecost going to influence global Christianity with? What are we standing for? What are we passing on as a revealed portion of Christian truth to the nations? What are we saying about the Kingdom of the next world and pouring into the great stream of Christian tradition that flows through the churches of this world? Most importantly, however, is the toughest, most crucial question of all that demands an answer of us: is the global influence of Pentecost guided by truth and order or by error and confusion? The numbers and percentiles may be impressive and may prove we are rapidly doubling in size at impressive rates, but the simplest principle behind church growth applies handily here: Quantity never guarantees quality. And the quality of Pentecostal and Charismatic growth is seriously infected by the errors we've mentioned above as well as many localized doctrinal and practical scourges that hobble the impact that I feel the Lord would have us make in this dying world of lost people. There may be a robust blossoming of Full Gospel fellowships springing up all over the urban sprawl of world-class cities and in the deepest, most remote parts of wildernesses on all five continents, but if they begin out of division from other Christian fellowships, proceed with erroneous and questionable teaching and advance a vision based upon bad doctrine and practice disguised with a sliver of truth, what has been gained? And what does this mean to the evangelistic harvest of the souls of men and women under the covering of these error-ridden fellowships? Are disciples of Jesus Christ being made by these churches around the world or just market share for sheep-stealing preachers and organizations with pet doctrines and divisive theologies? Pentecostals have long been accused by their many detractors as having truth that is a mile wide, but an inch deep. We have been accused of being shallow and superficial. Yet even as we deny this, a lamentable part of our long established history has been one of division, breakaway, preacher-worship, and a serious obsession with displays and manifestations of religious experience. "Spiritual authority" has long been the imbalanced focus of our movement - not spiritual discipline, the true focus of Christian spirituality. And all of the popular, romanticizing versions of our history which some Charismatic writers have produced simply cannot whitewash this fact away. These painful historical realities came about because of our tendency toward avoiding serious reflection upon how we fit into the overall big picture of Christianity. Many of us find it more "faith building" to hear a personal prophecy or do be "slain in the Spirit" than deal with the tougher yet far more enduring issues we should be grappling with such as living out authentic Christian lifestyles guided by Bible truth and sound teaching, and becoming rooted, grounded, mature believers walking by faith and not by sight alone. As Charismatic pastor Robb Thompson once said on a Sunday morning in a pointed indictment that was painfully amened by his congregation I was visiting among, "our fundamental brothers, they know how to hang in there with the Lord when their prayers aren't answered right away. When we Charismatics don't, we backslide." If this wasn't true, then the kinds of moral lapses, legalism and signs and wonder-chasing that plague Pentecostals and Charismatics wouldn't be seen as they so readily are. For all of our fiery revival preachings, prophetic messages in tongues and emotional, dramatic displays in our altars, the fact is that when too many of our tongue-talking brothers and sisters hit the ground on Monday morning, so to speak, after an encounter with God at church on Sunday morning, there isn't much of a difference between them and nonbelieving people around them, a fact not lost on them, either. 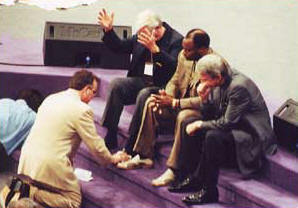 Pentecostal preachers and Pentecostals in particular have long been targets of the most vicious mockery by comedians, Hollywood, and social commentators who see in them the embodiment of hypocritical ignorance - and our tradition's uncritical acceptance of superficial spirituality as the Way It Is only fans the flames. Throw in the high-level implosions and of televangelists who are largely Charismatic or Pentecostal and a select survey of their onscreen and community antics and it isn't hard at all, then, to understand why many non-Pentecostal believers look upon Pentecostals as somehow suspect fanatics who are a danger to their own church communities. And though just as many of them are reaching out, building bridges and openly dialoguing and learning from us, the fact remains that our errors and fanaticism have chased the others off and that among evangelicals of all stripes, there is a horrifically free exchange of the same questionable teaching and practice going on we've already mentioned. So the twisted snares of heretical teaching, false doctrine and even spiritually abusive, even cultic practices keep finding new life, new hunting grounds, new blood to feed upon. The parasitical nature of these errors is perhaps what is most troubling of all - they can only exist by being well hidden among what elements of Biblical truth that Charismatics and Pentecostals do present to those seeking to learn from them. The Biblical truths that Pentecostals uphold are not theirs alone. These are indeed the spiritual heritage for all Christians throughout history. Sadly, it has been believed upon and manifest only among those who would identify themselves as Pentecostals and Charismatics, although I am convinced this was never God's will since His Spirit is said to be poured out upon "all flesh" in the last days (Joel 2:28). The essential spirit of the Pentecostal dynamic itself is the Biblical teaching that the work of the Holy Spirit enables and empowers Christians in two post-salvation encounters of God's grace known as sanctification and the baptism of the Holy Spirit evidenced by speaking in tongues as He inspires them. This inspired, ecstatic utterance is used by God in prophetic or exhortational occasions, but it is not to provide new doctrine or new additions to the closed canon of Scripture. Such powerful spiritual manifestations are also part of several other divinely, supernaturally provided spiritual giftings that are also listed in 1 Corinthians 12:1-12, given by God to the Church to be used as His Spirit directs (v. 11, 1 Cor. 14:1). Moving through human vessels, these visitations of God's Spirit in the testimony and deeds of Christian witness will change lives and confirm the Gospel of Jesus Christ to the glory of God the Father and the building of His Kingdom among the nations. These Biblically mandated empowerments of the Spirit apparently had no expiration date, despite what many non-Pentecostal Christians may think or believe, but were meant to be a part of the power that Jesus supplied to His Body, the Church, as part of the work of preaching the Gospel. But as we have said, it is this divine empowerment that has been tragically submerged by the rubble of religiosity and unbelief, a loss that deprives the Christian Church of a precious legacy it direly needs. Among today's Pentecostals and Charismatics, a sound understanding of the Biblical teaching and distinctives they reintroduced to the Church are being lost to their collective memory, and it is increasingly difficult for many of our communities even to tell what really is true and false doctrine anymore. When Pentecostal and Charismatic church leaders emotionally cry out in the same breath that Christians are to be known by their love for one another as the only basis for spiritual unity and that doctrinal unity is irrelevant to this, it is clear to see why the collective spiritual confusion among Pentecost grows by the day. When such a critical foundation as Biblical doctrine is discarded by those who are supposed to know better, there is no alternative but a fuzzily "sloppy agape," an unduly overemphasized embracing of experientialism that sacrifices objective Christian standards on the altar of "fellowship." The problem is not that experiential faith or unity based on divine love is being asserted - these are obviously vital aspects of Christian life. The problem is when they become reckoned by Christian leaders as the only hope for renewal in churches at the expense of Christian doctrine, flying in the face of over 2000 years of toil and sacrifice by the Church to preserve the Faith we are to contend for. With such attitudes, it is inevitable that when pressed to stand for something, the Pentecostal and Charismatic churches in the present day are clearly shooting themselves in the foot: thieves of faith lurking around the church don't have to crack our safes when they're left so wide open for plunder at their will. Why is this happening? Part of the reason for this is a long-established Biblical illiteracy - a lack of knowledge of and the inability to understand the Scriptures - that sweeps much of Christianity in these last days and which has also infected Pentecostals and Charismatics as well. Without the standards of the Word firmly in the Christian mind and heart, it is impossible to discern the competing claims of truth and error, and both pulpit and pew have been hit hard in this. Aggravation of the problem comes when Christians wilfully adopt teaching and practice in full knowledge of its questionable or flagrantly unbiblical nature. Another part of the reason is the fiercely independent mindset that Pentecostals have always had - disagreements on these issues are "solved" by division, rather than dialogue, often cutting off any hope of fruitful discussion that could right wrongs and preserve Christian unity. Magnified by carnal factionalism, churches and ministries split to go off on their own, reckoning their further fracturing of the Body as "God-ordained." Still another reason is Pentecostalism's fundamental rejection of identification with its' spiritual past, of heeding the Christian history that brought us to where we are now and thus provide insight and understanding from it. Blissfully ignorant of the wisdom of our Christian past, we march boldly into the present's firestorm, never suspecting how horribly vulnerable we are to the gale force winds of doctrinal and practical confusion that have blasted our movement since we simply have no frame of religious reference - doctrinal foundations - to go by. And a fourth reason for this has been our own spiritual pride over how "free" we are of "tradition." By ignoring or mocking where we have come from, presumptuously judging we need not learn from any perspective outside Pentecostalism, and believing that we are a new breed of Christian raised up by God for the last days harvest, we've effectively been deprived of the means to not only understand who we are, but the times and seasons of the last days themselves. Without admitting it, we've subconsciously dipped from a hundred evangelical wells for whatever sources of wisdom we could find to flesh out our own faith, which has further contributed to the splintering of Pentecostal and Charismatic communities themselves. These friendly volleys of misguided fire all proceed from the belief that they are God-ordained outpourings of recovered truth He wants known throughout the world and proclaimed through the energies of hundreds of Pentecostal and Charismatic leaders filled with a vision of that truth. We can't begin to call their sincerity into question, and that is far from our intent. But I have found that even if you show such church leaders that their revelation has been weighed and found wanting by the plumbline of Scripture, it often matters very little to them. Flush with the conviction that they've been divinely called to bear up the censers of their fire as living sacrifices before God, they will enthusiastically and passionately set out to offer it up unto Him as pleasing, even if their foundations clearly are wobbily erected on the shifting sands of human religious tradition. It doesn't appear to occur to them that to speak for God as "His servant" is the gravest responsibility a human being can bear in this world. They trifle in their pulpits and in ministry in ways beyond belief, almost seemingly unaware just how great an authority and example over men and women's spiritual destinies they wield. This presumption becomes evident as you observe how quickly they sanctify the latest teaching, book, or "revival" report as a divine revelation of truth at the expense of Spirit-led Bible teaching to the contrary that rightly divides and sets forth the truths of God's Word in a balanced manner. This is the great danger of the friendly fire we describe here - that Christian leaders know the potential for spiritual danger but do nothing to head it off and instead add explosive fuels to these strange fires, from sharing their pulpits to keeping their silence on it. Truly, no better term than "friendly fire" can be used to characterize error in the Pentecostal and Charismatic worlds. False doctrine and practice are potent salvos of powerful influence that are tragically misdirected at Christians with an end result of religious abuse, false prophecy, bad teaching and even deceptive cultism. Exploding beneath the seas of the Pentecostal masses around the world, this friendly fire has gone on unchecked for too long. With only the barest minimal of damage control in place, the Full Gospel Ship is in serious trouble, leaking and listing in hostile waters under fire from a thousand points. So with all of these distracting, divisive and even dysfunctional currents churning beneath the seemingly pristine "rivers of living water" we are supposedly bear, we are forcefully returned back to the original question I asked: just what is Pentecost going to influence global Christianity with? A few years ago, excitement and zeal ran high among many Pentecostals and Charismatics as the so-called "River of God" revival movement swept across their churches and touching many of them at virtually every level. From there were many fire-breathing preachers and teachers in both of these camps who poured out vast, inexhaustible amounts of rhetoric concerning what was going to shortly begin to happen. Some gravely intoned that part of the deeper workings of the "coming revival" would be a new and powerful recovery of what they called "the fear of the Lord," a renewed sense of inexpressible wondrous awe of His glory as it spiritually and even physically entered sanctuaries where Christians would gather. Christians would, it was said, be enmasse unable to stand before this divine manifestation and would find an overwhelming and sobering compulsion to humble themselves before God, recognizing their weaknesses and sinfulness in such a way that a newer appreciation and reverence of Him would flood the Body of Christ. But we've yet to see this happen, as much as it certainly would be welcomed. It would be a wonderful thing to see the hand of God working sovereignly in a wave of visitation that would shake modern, surfeited and backslidden Christian congregations down to the core, in verifiable outpourings that all in a community could not ignore. Certainly, such a holy renewal among Pentecost should first sweep across those who are assumed to be hearing from God most clearly, that being among our leading "five fold" ministers. But what we see instead, however, in the continued offerings by many of Pentecostal and Charismatic leaders are manifold expressions of "revelation knowledge", "fresh words," and "cutting edge present truths" that are are more concerned with the fickle concerns of Christians rather than a sharp focus upon the contemplation of God Himself. A vast plethora of ministry product lines turn one's attentions far more to how to receive personal benefits and blessings from God rather than how to stand before Him in that holy awe of godly fear. All you have to do is watch about an hour of Christian "television" to confirm this. Supposedly contributing to the advancement of Christian truth in the spirit of "true revival", these teachings and practices - noised abroad by citywide "campaigns" and satellite networks - are increasingly more preoccupied with one's place in the religiously material world rather than an intentional adoration of God in His spiritual place above all things. Instead of the "fear of God" being revived that will transform the world, we are seeing an enthroning of the "needs of the people" as paramount in God's endtime purposes. No one could be opposed to teaching how God is able and willing to bless and prosper His people. That is certainly beside the point. Nadab and Abihu were so proud of the honour they were newly advanced to, and so ambitious of doing the highest and most honourable part of their work immediately, that though the service of this day was extraordinary, and done by particular direction from Moses, yet without receiving orders, or so much as asking leave from him, they took their censers, and they would enter into the tabernacle, at the door of which they thought they had attended long enough, and would burn incense. .. ..They took common fire, probably from that with which the flesh of the peace-offerings was boiled, and this they made useof in burning incense; not being holy fire, it is called strange fire; and though not expressly forbidden, it was crime enough that God commanded it not. Presuming thus to burn incense of their own without order, no marvel that they made a further blunder, and instead of taking of the fire from the altar, which was newly kindled from before the Lord and which henceforward must be used in offering both sacrifice and incense. .. They did it rashly, and with precipitation. They snatched their censers, so some read it, in a light careless way, without due reverence and seriousness .. There is reason to suspect that they were drunk when they did it, because of the law which was given upon this occasion, v. 8. They had been feasting upon the peace-offerings, and the drink-offerings that attended them, and so their heads were light, or, at least, their hearts were merry with wine; they drank and forgot the law (Proverbs 31:5) and were guilty of this fatal miscarriage. Their character made their sin more exceedingly sinful. For the sons of Aaron, his eldest sons, whom God had chosen to be immediate attendants upon him, for them to be guilty of such a piece of presumption, it cannot be suffered. There was in their sin a contempt of God's glory, which had now newly appeared in fire, as if that fire were needless, they had as good of their own before. What it was that Moses suggested to his poor brother upon this occasion: This is it that the Lord spoke. .. Where did God speak this? We do not find the very words; but to this purport he had said (Exodus 19:22), Let the priests who come near to the Lord sanctify themselves, lest the Lord break forth upon them. Indeed the whole scope and tenor of his law spoke this, that being a holy God, and a sovereign Lord, he must always be worshipped with holiness and reverence, and exactly according to his own appointment; and, if any jest with him, it is at their peril... What was it that God spoke? It was this (the Lord by his grace speak it to all our hearts!) I will be sanctified in those that come nigh me, whoever they are, and before all the people I will be glorified. First, Whenever we worship God, we come nigh unto him, as spiritual priests. This consideration ought to make us very reverent and serious in all acts of devotion, that in them we approach to God, and present ourselves before him. Secondly, It concerns us all, when we come nigh to God, to sanctify him, that is, to give him the praise of his holiness, to perform every religious exercise as those who believe that the God with whom we have to do is a holy God, a God of spotless purity and transcendent perfection, Isaiah 8:13. Thirdly, When we sanctify God we glorify him, for his holiness is his glory; and, when we sanctify him in our solemn assemblies, we glorify him before all the people, confessing our own belief of his glory and desiring that others also may be affected with it. Fourthly, If God be not sanctified and glorified by us, he will be sanctified and glorified upon us. He will take vengeance on those that profane his sacred name by trifling with him. But a certain man named Ananias, with Sapphira his wife, sold a possession, and kept back part of the price, his wife also being privy to it, and brought a certain part, and laid it at the apostles� feet. But Peter said, Ananias, why hath Satan filled thine heart to lie to the Holy Ghost, and to keep back part of the price of the land? Whiles it remained, was it not thine own? and after it was sold, was it not in thine own power? why hast thou conceived this thing in thine heart? thou hast not lied unto men, but unto God. And Ananias hearing these words fell down, and gave up the ghost: and great fear came on all them that heard these things. And the young men arose, wound him up, and carried him out, and buried him. And it was about the space of three hours after, when his wife, not knowing what was done, came in. And Peter answered unto her, Tell me whether ye sold the land for so much? And she said, Yea, for so much. Then Peter said unto her, How is it that ye have agreed together to tempt the Spirit of the Lord? behold, the feet of them which have buried thy husband are at the door, and shall carry thee out. Then fell she down straightway at his feet, and yielded up the ghost: and the young men came in, and found her dead, and, carrying her forth, buried her by her husband. Judgment begins in the house of God, says the Scripture. It will cost dearly for many eternally, but sadly, this price is already being exacted among the flocks of the Lord who call themselves Pentecostals and Charismatics - and our collective extremism is a large reason for this. Such a cost is too high already and as a Pentecostal minister, I cannot remain silent over it any longer, nor can the fellow Pentecostals who also have beheld this horror. That why we have set forth to create this special series of articles to examine, analyze, discern and offer correction to this confluence of confusion from explicitly Pentecostal perspectives. The several serious areas of critical concern that present themselves for examination in the Charismatic and Pentecostal worlds today will be examined from a Biblical and pastoral perspective. We will be using primary research sources produced by the leaders and teachers of these questionable and novel doctrines themselves. Their books, magazines, tracts, audio and video taped teachings and personally observed activity will provide us a solid sources of information that cannot be denied. Although we are Pentecostals, we feel we have a good degree of objectivity so as to properly and dispassionately consider the teachings and practices that we see as being in serious error or serious question and we will unblinkingly do so. We will address and discern teachings and will identify teachers and leaders as necessary, those who are calling down strike after strike of "cutting edge" teachings that are little more than rehashed and repainted examples of twisted Pentecostal and Charismatic traditions that are as unbalanced as they are unbiblical, and hence, filled with the potential for spiritual deception and spiritual abuse. Both graphics and Real Audio will be used as we shed light upon these questions. This website section will be an ongoing project that will strive to offer Biblical truth as the only antidote to the leavening of falsehoods running unchecked in the Pentecostal and Charismatic worlds today. Pleasing men is not our goal - only the pleasing of God Himself as His Word is upheld as the sole plumbline of discernment. I know I have probably sounded pretty negative, if not cynical, when I write about what I see the Charismatic and Pentecostal cultures stumbling into the errors it has. What, then, should we be looking for, praying for, longing for, hoping for? This is what the Lord lays on my heart as I pray for our world, our church, and the hour, as I consider Pentecost's inexorable move into the fork of the road of decision, and as we begin our humble yet determined efforts to fighting a global inferno of wild and strange fires roaring in our churches. I am hoping and praying that, even now, the Pentecostal and Charismatic world will return to the basics (for far too many of them, it will be their first time there). I pray that we return to just loving God so much that nothing else in this world matters, that we once again rediscover what it means to counting the cost for the Pearl of Great Price, the wonderful Gospel of our Lord Jesus Christ. I pray always that a passion for His holiness and purity and fidelity and faithfulness and integrity becomes an epidemic within our very souls but I also pray that such a passion for God is based upon a fervent attention and commitment to the "old landmarks" of His Word, of a desire to live by the Bible's eternally objective standards and not that of the deceptively distracting "new wine" traditions of men. I pray that we again renew our vows of our first love, and that we so hunger for the face of the Lord, and not His hand alone. I am pleading that we see that same glorious Face revealed and chiseled in the lives of all of God's people, however imperfectly seen, and that we see one another as we ought to - as literal brothers and sisters, not just "laity" or "clergy," in a true unity of the Spirit based upon Christian truth and not experience alone. I am still believing that we all can yet join one another in the vineyards of whitened harvest fields and once again win and make disciples of all nations as our Lord has commanded us. I am longing for a time when the people of the Lord once again hunger for the Word of the Lord like never before, that all the noise of religiosity be purged from our midst so that we may once again behold clearly God in Christ by the Spirit through His Word of Truth. I am praying that the "rhema" word be put in it's proper place for the more sure "logos" Word of prophecy. I am asking God to once again ignite the anointing that abides in us all to collectively compel us to feed together around the milk and meat of the Word of God. And how I have prayed and hoped that a thirst and hunger for truth and righteousness simply invades the Body and drives us into the inexhaustable riches of Scripture to see and hear our Good Shepherd's call. I am crying aloud that the same people of the Lord find their hearts rent by what they find in the Word and learn again what it means to pray as never before. That we simply get a holy addiction to calling on the Name of the Lord to the extent that we will do NOTHING unless we hear "thus saith the Lord" in regard to our directions and plans, a "thus saith" that will be fully based upon what He has already delivered to us in Scripture. That the focus of all we do once again be simply the only thing our Lord commanded .. "to teach all nations .. to preach the gospel to every creature." That we once again really know what it means to stand in the gap and intercede for neighbors and nations, for sinners as well as saints, for the despised as well as the loved, for the Body as well as the children of darkness. And I am hoping beyond the almost hopeless situation I see that we may yet still once again learn what it means to be burdened, called, visited and commissioned to be lights in the world, salt in the earth, and yes, a peculiar people. That we once again realize that we are a chosen generation meant to be servants called aside to the commands of a Lord. That we see all the carnality and foolishness we have institutionalized within our fellowships for what it is, expunge it from ourselves, sanctify ourselves once again, and of a TRUTH really let the church be "the Church" .. the holy community called to bring to a dying world the Hope of the Ages in the revelation and proclamation of a Risen Savior. Once these things are personally realized in the lives of God's people, I contend, we will see the outbreak of a revival in the land that will make the so-called revival "outpourings" of recent years pale in comparison, as birthday candles trying to outshine a midday sun. We will see things and hear of tidings that will make us tremble in holy excitement, as well as holy fear. I will die trying, praying, doing all I can to urge us on to accept nothing less, even though I know Scripture, as I see it, shows that the last days apostasy of the Body will only get worse. I would rather face my Lord at the Bema Seat knowing I gave my all, that I went out fighting and contending for the Faith, then to have tubed down "the river", spoken my blessings, or heard a rhema for someone else that the Lord never spake. Commitment, not compromise, is the royal road to God's best for anyone's life. The Pentecostal outpouring can accept no less either. (1) Cross, James ed. Healing In The Church (Pathway, 1962), p. 44.